The New Year ushers in even more exciting developments and events in Austin&apos;s Warehouse District. 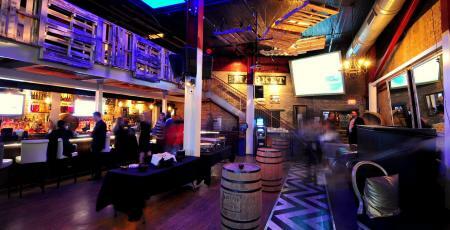 In February 2014, The Market and The Tap Room at The Market opened in the former Six Lounge and Tap Room space. The owners look to bring back the area&apos;s old Warehouse ambiance, much like when the building housed Nelson Davis and Son Grocery Market in the early 1900s - but with a contemporary twist. Don&apos;t miss the official grand opening happening in April! In 1905, on the southeast corner of 4th and Colorado, Nelson Davis built a warehouse and office for his family&apos;s wholesale grocery. This served as the hub of grocery distribution for Austin for many years. The Market (pictured above) brings this historic building back to its roots with early 20th century décor, while natural exposed brick and wood play up the warm, inviting atmosphere. The staff is even more inviting, willing to take the time to make you a carefully crafted classic American cocktail with a modern twist. 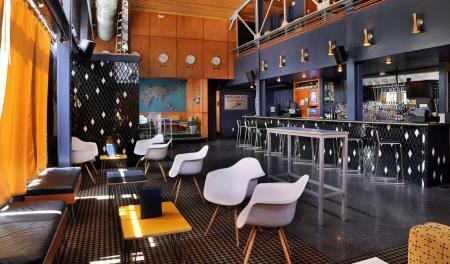 Nearby, the night heats up at Hangar Lounge (pictured below), an upscale, aviation-themed bar retrofitted to look like a 1950&apos;s airport lounge. The spacious venue is decked out with airplane décor, world maps and a worldwide array of clocks. This hotspot is known for its incredible rooftop view, where guests can relax, sip and gaze across the city. Some cannot-miss cocktails include the French 77, made with St. Germain, lemon and J Roget Champagne; and the Hangar Diablo, with Tanteo jalepeño tequila, lime juice, agave nectar and fresh cucumber. These are perfect complements to the vibrant rooftop environment. The lounge plays host to a number of events year-round, especially during major city happenings like SXSW®, MotoGPTM, the FORMULA 1 Racing Series and, new this year, the X Games Austin.